I interviewed 12 artists and made “Menu‐Portraits” of them. 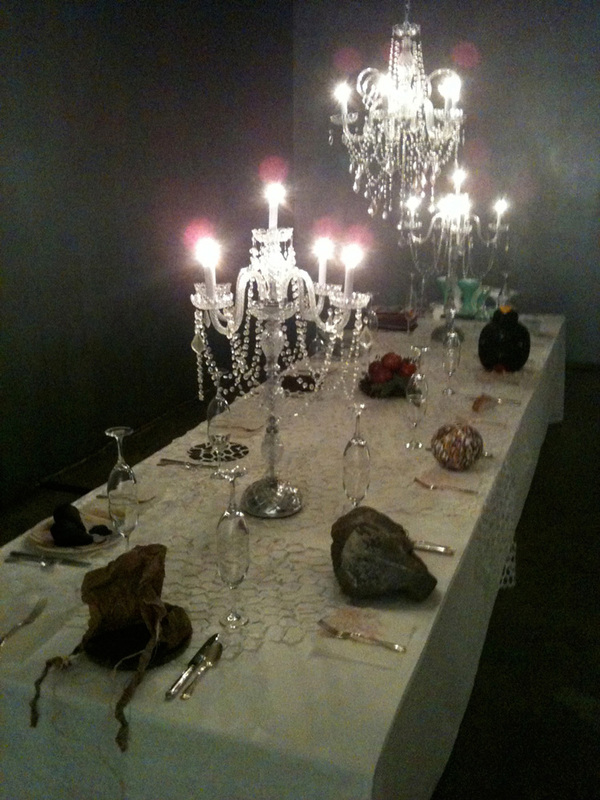 They in turn, made elements for a 16‐foot supper table installed at Josee Bienvenu Gallery, New York. The installation included crystal lighting fixtures in which I replicated the crystals in cast hard candy—over 1800 candy crystals in all. Polly Apfelbaum, Greta Byrum, John Corbin, Marti Cormand, Annabel Daou, Eteam, Rochelle Feinstein, David Humphrey, Allison Katz, Alison Knowles, Marco Maggi, Stefana McClure, Alex Melamid, Adam Ogilvie, Sarah Oppenheimer, Ken Solomon, Chef Joseph Jae Kim. The project resulted in an artist’s book, First Supper available in hard cover, paperback and pdf editions.